This tutorial assumes that you have some understanding of jQuery but I’ll be explaining everything as we go so should be good for beginners as well. You will also need to understand HTML and CSS. I’ve included the finished files and a demo so you can see what we are going to achieve. 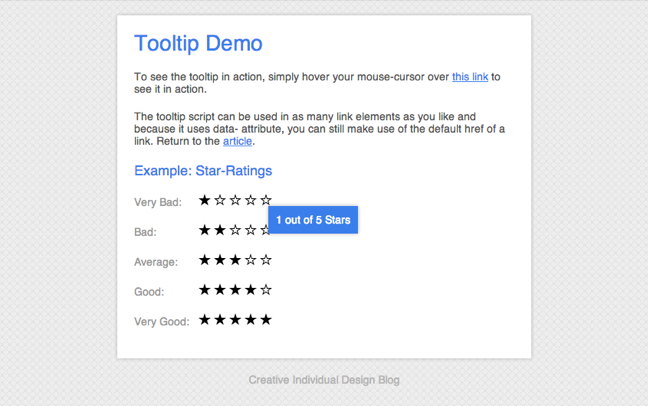 The tooltip that we will be creating will appear when we hover over a link. We will use the HTML5 custom data attribute (data-*) to hold our information, then use jQuery to dynamically create a container (div) to hold the information within the custom data attribute. OK, first create a new HTML file and insert the usual DOCTYPE, html, head, etc. information. Notice I am using the HTML5 DOCTYPE. Add links to your CSS and Tooltip JS files, and create these files. I’ve used layout.css and tooltip.js respectively. You will also need to link to a hosted jQuery library or host your own. I personally prefer to link to Google but use whichever option is best for you and your project. Now, add a link (<a href…) with all the usual attributes. I am using the hash symbol (#) because this is a test and I don’t want this link to go anywhere but this script works perfectly with real links. Finally, add our custom data attribute. For readability I am using data-tooltip but feel free to use something which better describes your content. In the demo (and downloadable files) I’ve also added some basic styling such as background, color, padding and even box shadow to improve the effect, but I’ll leave this up to you to style the tooltip to suit your site design. Open up tooltip.js and write out the document ready function – feel free to use the shorter version but for readability I will use the full function. Next we want to target any element with an attribute of data-tooltip, so this will be our selector. The action will be .hover. We first want to create the div which will hold our tooltip information. Remember from above that this will be a div with an ID of tooltip. We will use .before to position this div before our link in the DOM. This is why position and z-index are so important in our CSS – these position the tooltip div visually above our link (and other content) and stops any nasty content jumping from occurring. Note the single quotes used. Next we want to get the information from our data attribute and store it in a variable. I have put this variable above the previous line which is good practice, especially in cases where I would be using more than one variable, i.e. keeping them together. Finally, we want to add the information stored in our variable to our new div. We can use .text to achieve this. If you have any basic knowledge of jQuery you will know that .hover also includes hover off within the action. Let’s make use of that now to delete the tooltip div when we move our mouse cursor off the link. We simply need to use .remove to achieve this. We are almost done. The last part is to get the tooltip div to follow our mouse cursor as it moves around the link. I have used a similar effect in a previous post. First we want to create two variables which will tell the div how far away from our cursor to move so that we can easily see all of the text. The action of the tooltip div moving occurs when we move our mouse cursor around on the link with the data attribute, so this is what we will be targeting with the .mousemove action. We then just need to use .css on our tooltip div to move it from the top and from the left – remember that we used position: absolute in our CSS, this is coming into play again. Load up your HTML page and check out the script in action. You can download the complete tutorial source code by clicking on the big button below and unzipping the file. If you liked this post, please share it with your friends - Thanks! up. The words in your article seem to be running off the screen in Safari. Thx for ur code, but i think there are already too many solutions for this. Laura you article rocks! See I am just a web design guy in South Florida, work for a web design firm that provides more internet marketing than coding, though the are experts at email marketing and lead generation. Think we are always looking for skilled programmers who are looking to do side work. Anyway, our site is tombecksmedia.com and our number is 561-983-1434 talk to you sometime. Awesome! Thanks for sharing ! Great article …Thanks for your great information, the contents are quiet interesting. Thank You for sharing your important information. Creative Individual is written by Laura Montgomery, a Website & Graphic Designer based in the lovely Lake District, Cumbria. Laura is a nice girl who is always interested in hearing from others, so please feel free to contact her.